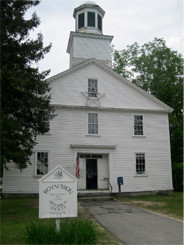 The Royalston Country Fair was held on Saturday September 10th. As part of the activities, the Historical Society put on the supper that evening with cooks from around town providing their particular expertise in the culinary area. Coordinating the supper was Beth Gospodarek and along with other ladies of the society smoothly had all aspects of the night under control. A variety of soups were brought out. The main course had many tantalizing dishes followed by numerous desserts. Prior to the meal, a cocktail hour was observed downstairs in the town hall with Carl Kamp providing music. I wish to thank all who assisted, all who provided food and those that came to enjoy the evening. After supper a 15 minute film was shown of the floods that happened in 1936/38 and other activities of bygone days. The proceeds of the supper will help to continue the work being done on the Historical Society building. This entry was posted in News and tagged country fair, Historical Society Building. Bookmark the permalink. ← Treasurer and Secretary Positions Available.